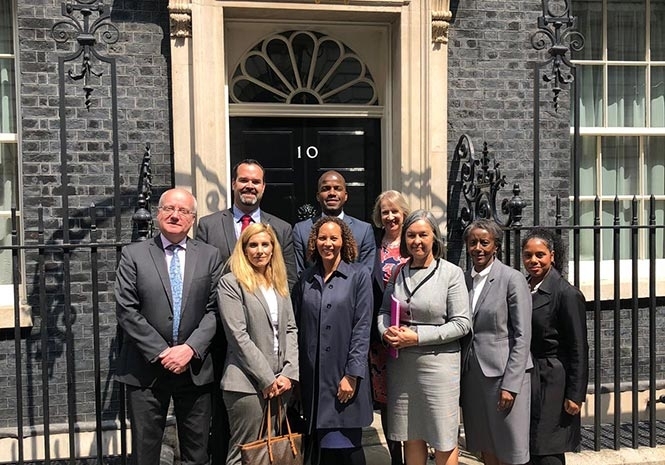 DR LIESL MESILIO, CEO and Chief Scientist of the Department of the Gibraltar Environment, Heritage and Climate Change attended a meeting held at No10 Downing Street for the Overseas Territories (OTs) on the Environment. The meeting was hosted by Sir John Randall, the Special Advisor on Environment to the Prime Minister. The issues discussed included Brexit, international platforms, renewable energy, climate change, HMG’s Oceans and marine protected areas agenda. The meeting was very positive and illustrated a commitment on the part of HMG to have closer ties and working relationships with the Overseas Territories on the environment moving forward. This was the first meeting with further meetings envisaged as the Territories work together for greater and stronger collaboration between the British Government and the Overseas Territories on environmental initiatives and campaigns at an International level. There are 14 Overseas Territories (formerly colonies), namely, Anguilla, Bermuda, British Antarctic Territory, British Indian Ocean Territory, British Virgin Islands, Cayman Islands, Falkland Islands, Gibraltar, Montserrat, Pitcairn Islands, St Helena, Ascension and Tristan da Cunha, South Georgia and South Sandwich Islands, Turks and Caicos Islands. British Antarctic Territory and British Indian Ocean Territory are administered from the Foreign Office in London whilst South Georgia is represented by the Governor of the Falkland Islands.